In a marketplace which is populated by an ever-growing number of custom drum builders, DW drums still stand out. The company's reputation has been built on its quality of workmanship, level of innovation and willingness to react to drummers' needs. This kit scores full marks on all three of these criteria. A fourth - its sound - also bags maximum points. Innovative in pretty much every way. Build, sound, everything. The top end Exotic range finish - it's lovely, but a simpler one would lower the high price considerably. Specialised Shell Configuration, or SSC, is a process which mixes DW's various Collector's Series shell options to create the ideal drum kit. By exploiting the differences in construction methods across individual drums, DW claims to be able to maximise sonic qualities. This particular kit - the first SSC kit to reach the UK - was assembled by DW's master drum designer John Good. To fully appreciate the SSC concept, some familiarity with DW's shell designs is required. The standard Collector's Series shell consists of seven plies, each 1/36" thick, with the plies cross-laminated in the usual manner. The outer layer of ply runs horizontally around the shell. "In performance the snare was close to orchestral - it gave perfect responses even when played right in the edge with the lightest of touches." After much experimenting, John Good came up with the VLT or Vertical Low Timbre shell. VLT shells include another layer of ply, making a total of eight, with the plies arranged so that the grain of the inner and outer plies runs vertically. This encourages the shell to vibrate more freely, resulting in a lowered fundamental tone. John Good's research continued and in 2008 DW's revolutionary X-Shell made its debut. Again based on an 8-ply sandwich, here the grain of each ply runs at 45 degrees with the plies cross-laminated at 90 degrees to one another. Sonically, X-Shells have a lower fundamental than VLT shells. Then in 2009 DW announced the arrival of the VLX shell. Similar to the X-Shell design, VLX shells are 8-ply with a 45 degrees grain for six of the plies. The other two plies feature vertical grain and are strategically placed for maximum effect. VLX shells take another step down in terms of fundamental tone, making for an even lower note. As with the standard Collector's Series shells, 3-ply reinforcement hoops are optional across all the different shells. Drummers ordering a Collector's Series kit have been able to specify from the various shell configurations before now; what's new about SSC kits is that DW now recommends the optimum shell for each drum. 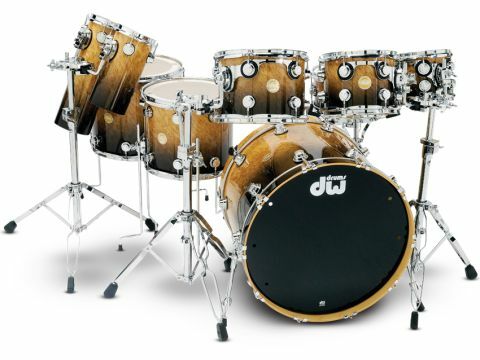 John Good is confident that DW's expertise in this area will create kits in which the component drums are in complete tonal and dynamic balance: 8" toms, for instance, through the nature of their size can sound tinny and slight alongside larger drums. By making the 8" tom an X-Shell, its fundamental tone would be lower, giving it a richer, throatier response with which to compete with the rest of the kit. At the other end of the scale, floor toms can be capable of dark shudderings that would register on the Richter scale but won't translate into a distinct note front-of-house. Here, VLX shells with their super-low fundamentals would enable you to keep the heads relatively taut but still extract resonant notes. So the theory extends across the kit. SSC kits have been designed exclusively for maple drums and any Collector's Series shell size can be ordered. The review kit consists of a 23"x18" bass drum, 14"x6" snare, 8"x7", 10"x8" and 12"x9" toms and 14"x12" and 16"x14" floor toms. Standard Collector's Series shells don't feature on any of the drums. Instead, the 8" tom is an X-Shell, the 10" and 12" toms and snare drum have VLT shells and the floor toms and bass drum are made to the most recent VLX design. Reinforcement hoops are included on all of the drums with the exception of the snare. Also included with the kit is a pair of 6" diameter Rata drums. The above video features John Good talking about the nuances of shell construction with Neil Peart (you can watch part two here). These are well worth watching, not least for the double act that Good and Peart make, but also for the demonstrations that illuminate the terminologies and the theories behind them in a straightforward way. DW first built a 23" diameter bass drum for Neil Peart. The design was so successful that it has since become a regular option in both Collector's and Jazz Series. Any reservations we might have had about an odd-diameter bass drum were swept aside upon hearing it. Straight out of the box the drum had the windows of the room we were in rattling in their frames. Combining the might of a 24" drum with the focus of a 22", it delivered a huge note with stunning clarity. The VLX shell worked its trick of lowering the fundamental, so without needing to slacken the heads the drum gave a deep tone that was suffused with low frequencies. The regular tuning meant that the drum was quick to respond, making it easy to work quick figures into the pedal. Though there was plenty of volume on tap, the quality of the sound was unmistakable. It was too polished a drum to get its message across by just being brutally loud. With their mixture of X-Shell, VLT and VLX configurations the toms were similarly irresistible. The 8" and 10" toms were bright and cutting but unusually meaty and powerful too; the 12" tom had nearly all the attributes of a 14" drum, while the floor toms snapped back full, fat notes that sat clearly in the mix. Individually, each drum was tonally centred and fit to burst with warmth and saturation. Played together, the intervals between each tom and the overall spread of frequencies was so harmonious that serious overplaying (on our part) ensued. The VLT snare drum has 10 plies rather than the usual eight and no reinforcement rings. In performance the drum was close to orchestral - incredibly sensitive, it gave perfect responses even when played right in the edge with the lightest of touches. Moving up through the dynamic register it matched every increase in velocity with added volume. At the top of the scale, when being hit with Grohl-like aggression the drum was so loud that it sounded as though we were rimshotting with every stroke (we weren't…). It was so versatile a drum that we struggled to imagine a genre that it couldn't be used in. The two Rata drums produced loud, percussive cracks that cut through easily. A total of eight are available, but at nearly £800 each they are pricey add-on drums.